Paul Stover and the customer support team. 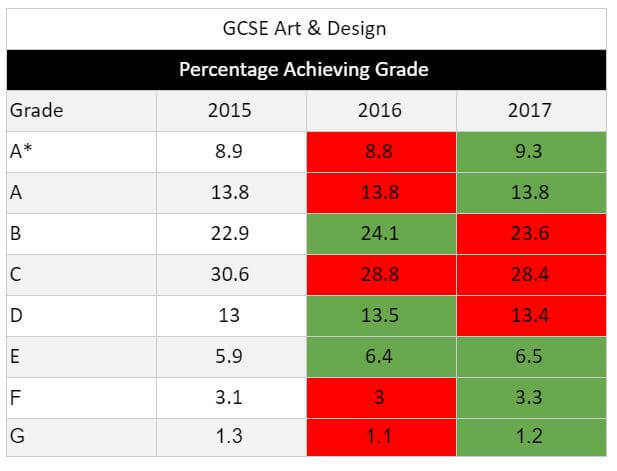 2017 GCSE and A-Level results are out and IVE has poured over the data to look at what this tells us about the ongoing state of Arts Education in England. Specifically, we reviewed OFQUAL’s provisional Summer Exam Entries report and the excellent analysis done by Schools Week. 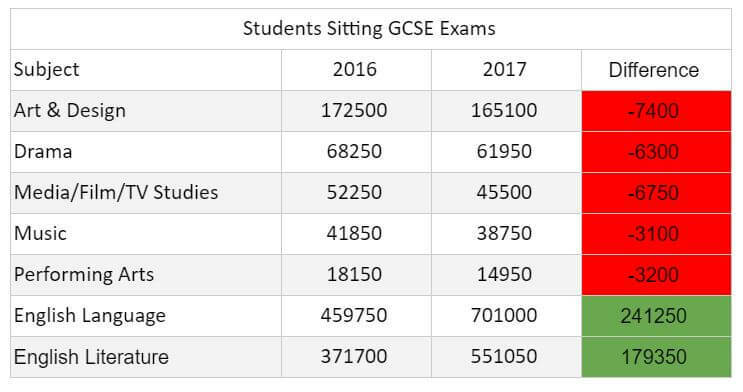 These numbers only apply to England as exam approaches are becoming continually devolved. Starting with A-Levels, these exams have seen huge changes this year with 13 subjects being revised to move all assessment to the end of the course, alongside an across the board general reduction in coursework. 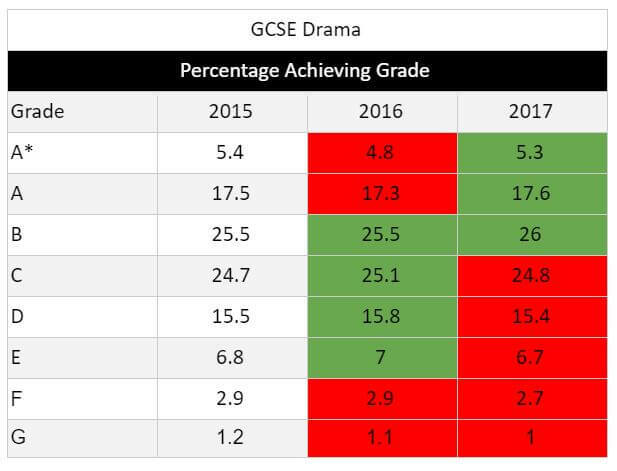 The end result, as the chart below (using data gathered from Schools Week) demonstrates, is an increase in top grades (particularly A* which has increased for the first time since 2011) and lower grades, with a reduction in B,C and D grades and slightly fewer students overall attaining an A-Level (98.1% this year vs 97.9% last year). Red = a year on year decrease, Orange = no movement and Green = a year on year increase. 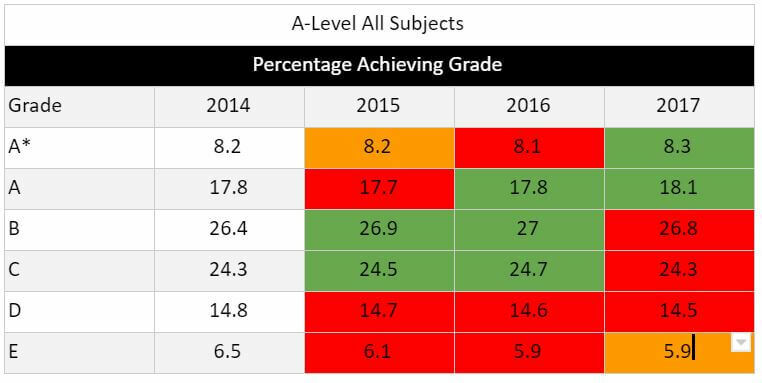 Despite the increase overall in A* grades, A* levels have fallen in the 13 revised A-Level subjects. This is to be expected as part of the rationale behind the revision was to increase the rigour of the qualification. Interestingly Art & Design bucked this trend with a slight increase in A* results year on year. Effectively, A-Level results are demonstrating a pattern of an increasing gap between high-level achievers and those failing to meet expected standards. This is replicated somewhat amongst subjects in the arts and culture sector, such as Music, and Art & Design. 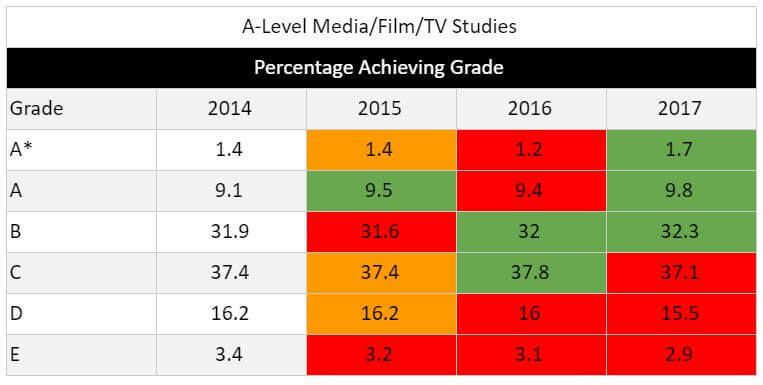 Whereas in Drama and Media/Film/TV Studies we see a generally positive trend of increasing attainment. A-Level results reflecting growing levels of inequality which are recorded across most of society. The reduction of students taking arts and culture subjects means that those left are the most passionate and talented, pushing up the proportion of high achieving students in these subjects. This would not account for the corresponding increase at the opposite end however. Reduction in coursework places more pressure on the failure point of exams, so students who typically may have achieved C or D through coursework are more likely to get an E result. This also rewards students who already do well at exams. OFQUAL also records data on the number of students sitting summer exams. 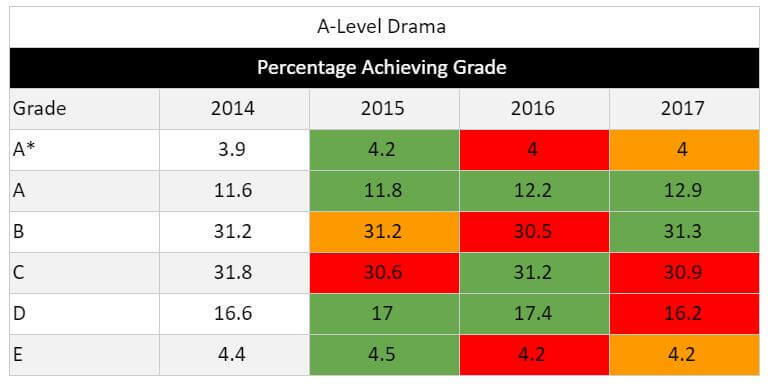 Year on year we can see a clear trend of decreasing numbers of students taking arts and culture subjects. At GCSE level English Literature, English Language and Maths have been amended to the new 9-1 marking system. Much attention has been focused on these new exams but a broad consensus is that results have remained relatively consistent, if slightly better than expected with nearly 2000 students achieving all level 9 or A* results, far more than was considered likely. 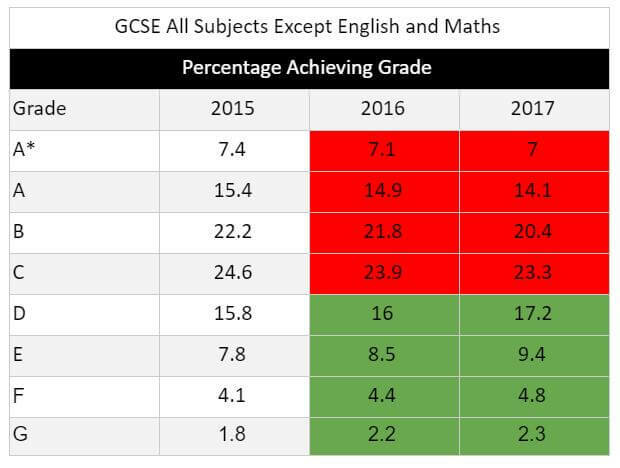 Outside of English and Maths though the results show a year of general decline in results. But that general trend is not reflected in arts and culture teaching. Indeed, unlike at A-Level, there is no consistent pattern emerging from GCSE results. 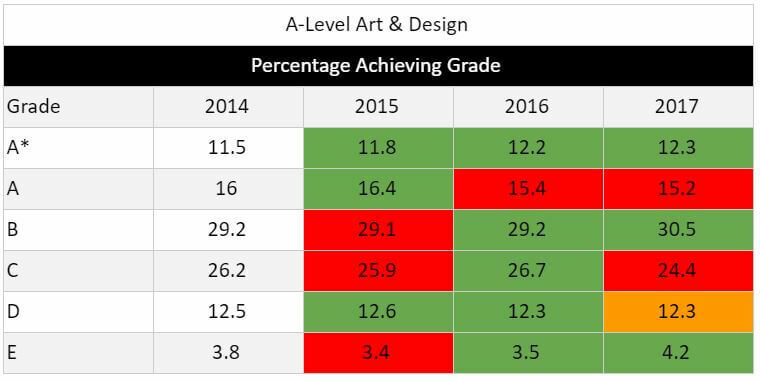 Art & Design fell into the same pattern as A-Level with increases at the top and bottom and reductions in the middle. However, Music and Drama showed overall increases. While Media/Film Studies showed no clear pattern whatsoever. One thing that is consistent though, is the decreasing number of students sitting arts and cultural exams. 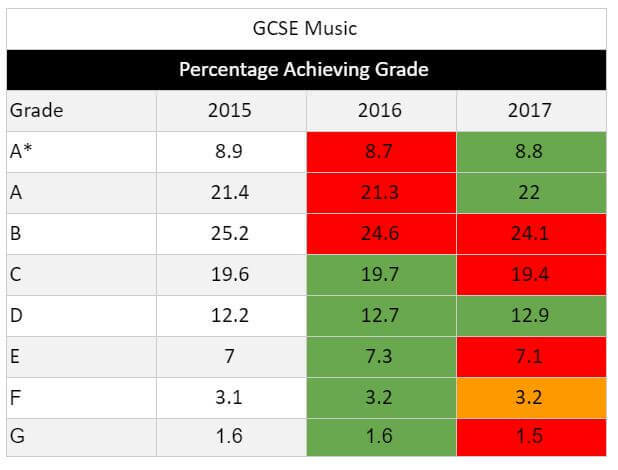 With the introduction of the EBACC, Progress 8 and Attainment 8 measures arts subjects are not a priority for many schools with the majority of students unable to take more than 1 or 2 arts subjects at GCSE. Some schools are, however, managing to buck the trend enabling pupils take all of the Ebacc subjects and up to 3 arts subjects as well, proving that it is possible if the intention is there. 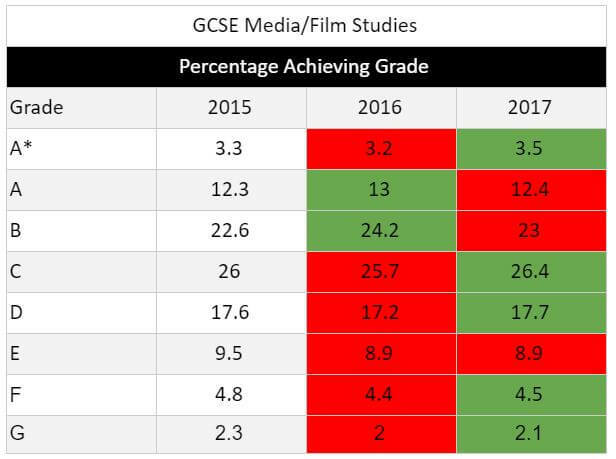 While it is gratifying to see that arts and cultural subjects are continuing to be taught well and even, in the case of GCSE’s and the revised A-Levels, bucking overall trends in declining standards, a few takeaways from these results are clear. For starters, more needs to be done to help those students that are underperforming in arts subjects, particularly in preparing them for an exam testing model. More importantly though, fewer students are gaining the opportunity to take an arts subject at GCSE and A-Level. With increasing pressure to deliver good results in the EBACC subjects it becomes imperative that bridge organisations like IVE and our partner LCEPs and NPOs push for a greater inclusion of the arts into the curriculum, greater access to arts and cultural opportunities inside and outside school and raise awareness, via shared case studies, of how some schools are managing to buck the trend to enable pupils to take 2/3 arts GCSEs and achieve in all the Ebacc subjects too. This is where schemes like Arts Award and Artsmark become crucial. Artsmark provides a framework that includes support and advice for schools to enable them to embed arts and cultural opportunities into the curriculum aligned with school improvement plans to help raise pupil attainment. Arts Award provides a framework for schools and arts organisations to both accredit young people for the arts work they engage in and develop their leadership skills.